Atsuko Tanaka, Mie Sonozaki, Miyuki Sawashiro et al. Twenty years after her awakening, the hottest witch in gaming history is still searching for clues that could help unravel the mysteries of her dark past. 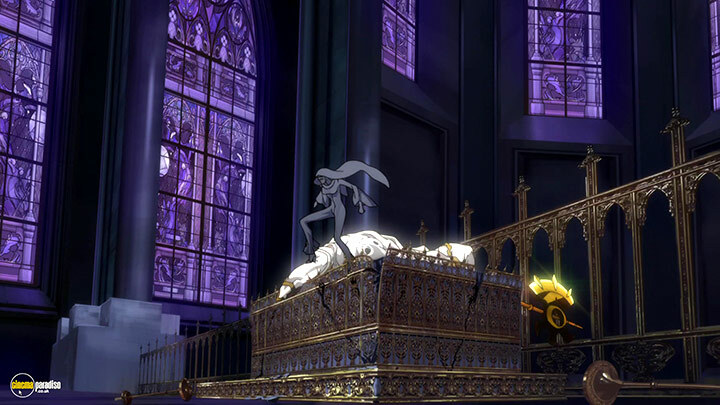 Aided in her quest by the clandestine weaponsmith Rodin, and his deadly creations, Bayonetta continues to leave a trail of angel corpses in her wake. Her search for answers leads to encounters with a mysterious - and eerily familiar - little girl, a vengeance-obsessed journalist, and a deadly white-haired beauty that seems to know more about Bayonetta than the witch herself. Fans of the franchise won't want to miss this chance to see their favorite fantasy come to life in a killer flick packed with mind-blowing action and scandalous scenes of seduction! I’m not afraid to admit that I’m not a gamer. Rarely having time for these ever-expanding video game franchises, most of these animated tie-in titles usually go over my head. 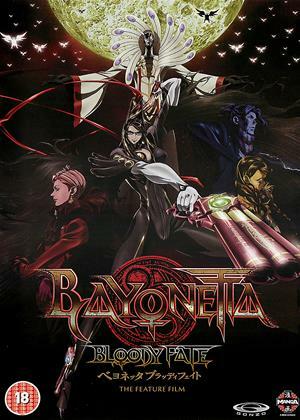 Bayonetta: Bloody Fate is yet another one of these movies that draws heavily off its source video games of which I have not played. Just because it’s trying to be faithful, however, doesn’t mean it can’t be accessible enough to be entertaining for those coming in cold. While I’m sure I’m missing out on a whole plethora of related lore, I must admit that I enjoyed the crazy nature of this film despite not completely grasping all of its nuances and references. The title character is a witch who acts as a nun by day and a leather-clad gunslinger by night. 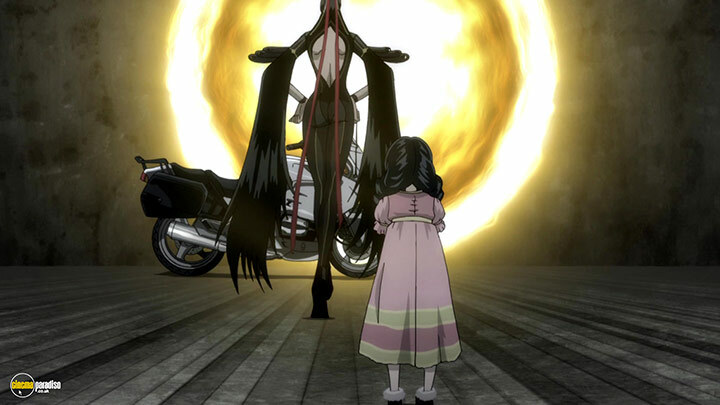 Her absurdly long hair forms the outfit by wrapping around her exaggerated size of breasts, legs and waist. The remaining hair is wrapped up in her beehive hairdo. 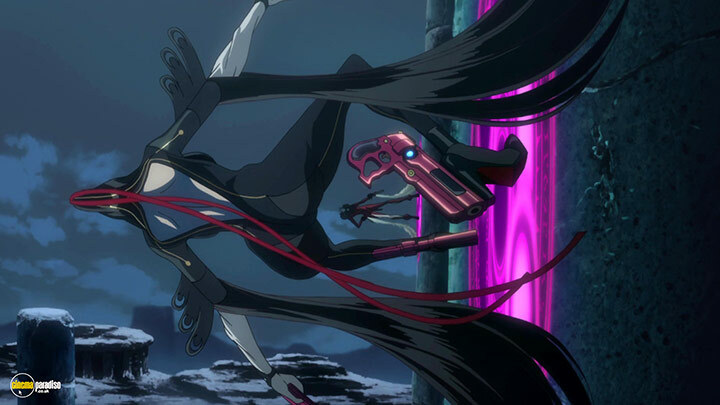 Pursued by the forces of angels who assault her with destructive horn instruments, Bayonetta’s weapon of choice are dual pistols which she keeps conveniently holstered on her heels. It’s a rather convenient spot when you’re mostly flipping through the air and to have the satisfaction of claiming you shot an angel with your foot. Her trump card is her hair’s other unique ability to summon demons from hell. Such traits of this female action star are ridiculous when displayed with the opening fight inside a church. I finally started to get into it when I noticed the winks to all the craziness of such a concept. 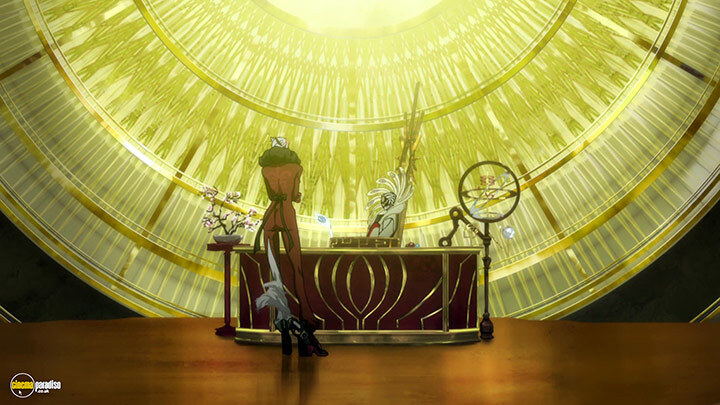 Bayonetta has an amusing demeanor to how she approaches every situation with a devilish smile and a snappy one-liner. She also has some solid side characters to play off of that include a nosy reporter and a little girl she ends up babysitting. 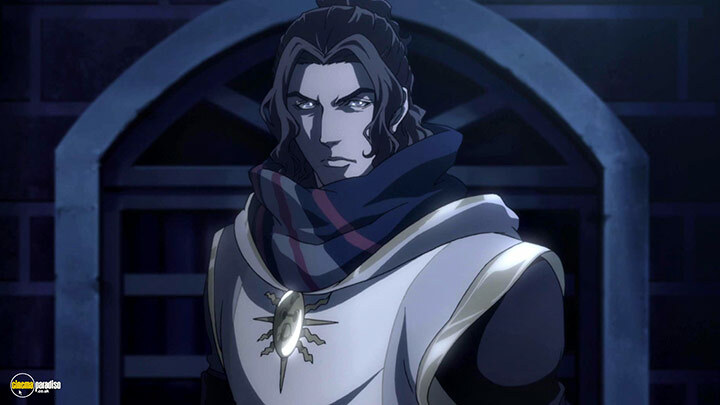 There’s a certain Saturday morning cartoon vibe to the way the reporter squirms and sighs at his failed attempts of exposing Bayonetta as a witch. He tries so hard, but ends up losing his footage at every turn. The little girl is also rather cute in how she looks up to Bayonetta as a mother even though she’s an absolutely terrible mother in her tone and lessons. 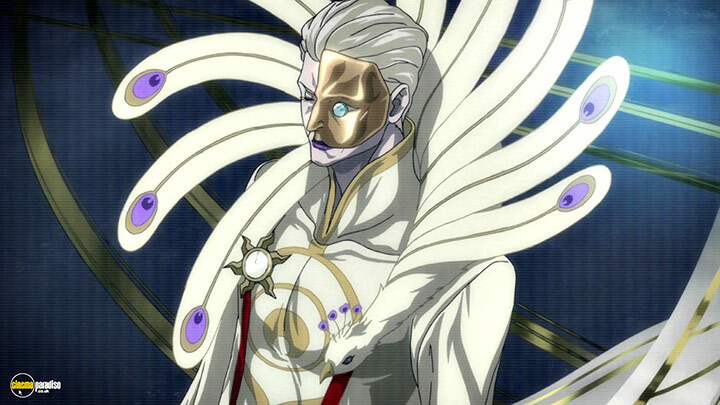 The plot is a bit all over the place, but from what I understand a group of super gods are coming to Earth and they need Bayonetta to make it happen. Not a big fan of heavenly figures dropping in on her planet, Bayonetta must do battle with a plethora of angels and hired guns sent after her. One bounty hunter happens to be Bayonetta’s equal in how she too carries a similar figure with matching weapons. The B-movie lover inside me howls when they trade fire that is perfectly matched to the point where their bullets ricochet off one another. The final battle between Bayonetta and the mighty gods just goes full-on insane. Taking the fight to what I assume is another dimension, Bayonetta summons some of the largest demons with bigger guns to fire at larger gods. The colors shift to bolder and brighter tones as the scales grows larger and larger. It's not that uncommon of a trope in which a climactic fight scene balloons to such absurdly epic levels, but I couldn’t help but fall for it. 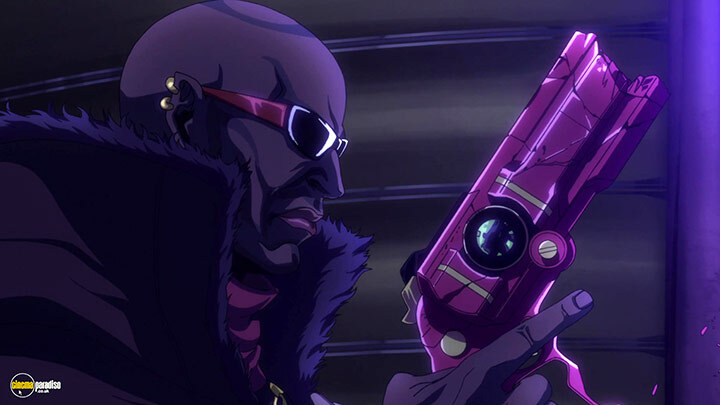 There’s a heavier focus on action for this film and it's a good choice seeing as how there’s nothing all that much intriguing about Bayonetta’s world. The time travel twist with trying to entrap the protagonist can be seen coming a mile away, but it wasn’t such a bland inclusion for how it compensates with plenty of creative fights and amusing dialogue. While this film didn't inspire me to play the video game franchise it's based on, I have to admit I did get caught up in it. I liked Bayonetta as a snarky witch, kicking out bullets and one-liners like a female Arnold Schwarzenegger. Even though she isn’t given much range, her upbeat spirit was still thrilling and a real pleasant change of pace from these anime movies that usually project the hero as stoic and silent. Bayonetta never stops talking and her dialogue never gets boring. The fight sequences are also incredibly well animated with plenty of detail and a ridiculous level of scale. I don’t normally go for these animated action movies that make you check your brain at the door to view, but this one made me plop out my grey matter and crunch some popcorn.